Cancer, according to Dr Craig Gedye, is like a jungle - dense, confusing, and, at times, terrifying. No two cancers are exactly alike, and this represents the greatest unmet challenge for patients, their doctors and scientists. “The challenges drive the themes of my research; the complexity and heterogeneity of cancers,” Craig shares. Craig believes that identifying individuals who won’t benefit from particular therapies is just as important as identifying those who will. With no point offering a treatment that will fail, the solution is to find novel opportunities for specific patients. Spanning the “whole breadth” of tumour biology, Craig’s efforts are concentrated on six, “very challenging” types of cancer. “I treat people suffering from melanomas, as well as testicular, kidney, prostate, bladder and brain cancers,” he reveals. Because of the focus of his work, Craig is also an “impromptu spokesperson” for “biobanking”. “When you have a cancer operation, surgeons cut out the tumour and pathologists put it under the microscope to determine its type, aggressiveness and what ought to be done next,” he explains. Adopting the simple saying ‘waste not, want not,’ the multitasking scientist is helping to establish systems for its set up and funding in the Hunter region. “We want to save samples from every patient’s cancer for research, because I believe they’re extremely valuable,” he affirms. Craig’s research career began in 1990, when he undertook a summer studentship between the University of Canterbury and University of Otago in his native New Zealand. “Normally you have to wait your whole professional life to be proven wrong, but I was humbled just six weeks after submitting my thesis,” he laughs. Craig relocated to Canada in 2008, undertaking a Postdoctoral Fellowship at the University of Toronto and Princess Margaret Cancer Centre. Aiming to expand upon his original thesis, he went looking for complexity in kidney cancer – this time forewarned and forearmed. Testing this hypothesis at each step, Craig spent the first half of his overseas stint exploring “problematic experimental biases” in the idea of cancer stem cells. “If you look at the idea of a queen bee cancer cell through the lens of all these overlooked biases and problems, the whole idea unravels.” This work has recently been published in Scientific Reports. While at the Princess Margaret Cancer Centre he simultaneously undertook a Clinical Fellowship in melanoma. “I was on the ground as the new class of cancer drugs, the checkpoint immunotherapy antibodies, came into the clinic,” he recalls. Craig moved to Australia in February 2014, signing on to pursue a number of related research interests at the Calvary Mater Newcastle, University of Newcastle and Hunter Medical Research Institute. His main mission is to cement a technical, nuanced understanding of kidney cancer. “It’s a different disease than most might otherwise imagine,” the School of Biomedical Sciences and Pharmacy affiliate acknowledges. Once considered a cancer of the surface layer (the endoderm), Craig’s analyses are suggesting kidney cancer is “better thought of” as a cancer from the middle layer and therefore mesenchymal cancer, or a sarcoma. He is similarly arguing that patients with the commonest form of kidney cancer, could benefit from different courses of treatment. “Clear cell kidney cancers contain ‘skinny’ mesenchymal cells that hunt for new blood supplies, and ‘fat’ cells that are full of lipids that batten down the hatches to survive,” he elaborates. In the not-so-distant future, Craig is planning to take a closer look at the 3,500 drugs that are currently licenced for use in humans. “Where kidney cancer is concerned, we’ll see if any come up as useful treatments that control if we get more fat cells and less skinny cells,” he affirms. “Cancer is tough. But it’s a privilege to be able to pit ourselves against cancer in the lab and in the clinic”. I am a physician/scientist, dual trained as a medical oncologist and as a basic science cancer researcher. I am inspired by working for patients with melanoma, brain, prostate, bladder and kidney cancers at the Calvary Mater Newcastle. I undertake clinical, translational and basic cancer research at the University of Newcastle/HMRI which is supported by the Hunter Cancer Research Alliance. My research focuses on complexity in cancer, with a particular interest in understanding "intratumoural heterogeneity". In every patient, every cancer cell is a bit different to every other cancer cell. Some cancer cells seem to be able to spread and cause trouble; others are less aggressive. What determines these differences? Can we exploit them to target cancer cells that are behaving differently? Between different patients, cancers that come from the same organ can behave completely differently, and treatments that help one patient fail the next. Why is this? Why does a cancer lie dormant, then come back? Why does treatment not work in some patients, or work for a time, then fail? These questions are incredibly important, as we seek to find the treatments that work best for each individual patient. We will do this by using existing treatments more cleverly, as well as by discovering new treatments. © 2019 The Author(s) Background: Atezolizumab, a humanised monoclonal antibody targeting PD-L1, is approved for locally advanced/metastatic urothelial carcinoma. SAUL evaluated atezolizumab in a broader, pretreated population, including patients ineligible for the pivotal IMvigor211 phase 3 trial of atezolizumab. Objective: To determine the safety and efficacy of atezolizumab in an international real-world setting. Design, setting, and participants: Between November 2016 and March 2018 (median follow-up 12.7 mo), 1004 patients with locally advanced or metastatic urothelial or nonurothelial urinary tract carcinoma who experienced progression during or after one to three prior therapies for inoperable, locally advanced, or metastatic disease were enrolled. Patients with renal impairment, treated central nervous system metastases, or stable controlled autoimmune disease were eligible; 10% had Eastern Cooperative Oncology Group performance status (ECOG PS) 2 and 98% were platinum pretreated (Clinicaltrials.gov: NCT02928406). Intervention: Atezolizumab 1200 mg every 3 wk until progression or unacceptable toxicity. Outcome measurements and statistical analysis: The primary endpoint was safety. Secondary efficacy endpoints included overall survival (OS), progression-free survival (PFS), and overall response rate (ORR). Results and limitations: The median treatment duration was 2.8 mo (range 0¿19); 22% remained on treatment and 8% discontinued because of toxicity. Grade =3 adverse events occurred in 45% of patients. The most common grade =3 treatment-related adverse events were fatigue, asthenia, colitis, and hypertension (each in 1%). Median OS was 8.7 mo (95% confidence interval [CI] 7.8¿9.9). The 6-mo OS rate was 60% (95% CI 57¿63%), median PFS was 2.2 mo (95% CI 2.1¿2.4), and the ORR was 13% (95% CI 11¿16%; 3% complete responses). Among IMvigor211-like patients (excluding ECOG PS 2 and other IMvigor211 exclusion criteria), median OS was 10.0 mo (95% CI 8.8¿11.9) and 6-mo OS was 65% (95% CI 61¿69%). Conclusions: SAUL confirms the tolerability of atezolizumab in a real-world pretreated population with urinary tract carcinoma. Efficacy overall and in the IMvigor211-like subgroup is consistent with previous pivotal anti-PD-L1/PD-1 urothelial carcinoma trials. These results support the use of atezolizumab in urinary tract carcinoma, including patients with limited treatment options. Patient summary: In this international study we investigated the efficacy and safety of atezolizumab treatment for advanced urinary tract cancer in a large population of pretreated patients, including those who would not normally be candidates for clinical trials. Patients tolerated the treatment well, even if they had autoimmune disease, were being treated with corticosteroids, or had disease that had spread to their brain. Life expectancy in this study for patients typical of everyday clinical practice was similar to that seen in trials that enrolled only selected fitter patients. © 2019, The Author(s). Drug repurposing offers advantages over traditional drug development in terms of cost, speed and improved patient outcomes. The receptor activator of nuclear factor kappa B (RANK) ligand (RANKL) inhibitor denosumab is approved for the prevention of skeletal-related events in patients with advanced malignancies involving bone, including solid tumours and multiple myeloma. Following improved understanding of the role of RANK/RANKL in cancer biology, denosumab has already been repurposed as a treatment for giant cell tumour of bone. Here, we review the role of RANK/RANKL in tumourigenesis, including effects on tumour initiation, progression and metastasis and consider the impact of RANK/RANKL on tumour immunology and immune evasion. Finally, we look briefly at ongoing trials and future opportunities for therapeutic synergy when combining denosumab with anti-cancer agents such as immune checkpoint inhibitors. © 2017 The Authors Biobanking consent processes should accord with patients&apos; preferences and be offered in a consistent and systematic manner. However, these aims can be difficult to achieve under healthcare professionals&apos; (HCPs) time-constrained workflows, resulting in low participation rates. This current perspective provides a brief overview of HCP involvement in consent and reports new data on participant attrition at each step of the biobanking consent process as experienced by 113 patients at an Australian tertiary cancer centre. To determine attrition in this HCP-driven consent process, we reviewed medical records for the following events: inclusion of biobanking consent forms; visible patient and HCP signatures; consent status selected (decline or accept) and specimen registration with local biobank. Accessible medical records revealed the following data: 75 of 85 records included viewable forms; 22 of 85 records included patient and 19 of 85 included HCP signatures; 15 of 85 records included signed and completed forms and 3 of 85 had samples banked with annotated clinical data. We compared these data with self-reported experiences of being approached to participate by HCPs. Of the 15 participants (17.6%) who successfully completed consent, only five could recall being asked and providing consent. The low enrolment rate is a considerable lost opportunity because most patients (59%) who were not asked to participate indicated they would have consented if asked. Furthermore, in comparing self-reported experiences with medical records, we believe cancer patients&apos; preferences for participation are mismatched with actual biobanking enrolment, which has considerable attrition at each step in the consent process. © 2017 The Author(s) Immune cells in the tumor microenvironment modulate cancer progression and are attractive therapeutic targets. Macrophages and T¿cells are key components of the microenvironment, yet their phenotypes and relationships in this ecosystem and to clinical outcomes are ill defined. We used mass cytometry with extensive antibody panels to perform in-depth immune profiling of samples from 73 clear cell renal cell carcinoma (ccRCC) patients and five healthy controls. In 3.5 million measured cells, we identified 17 tumor-associated macrophage phenotypes, 22 T¿cell phenotypes, and a distinct immune composition correlated with progression-free survival, thereby presenting an in-depth human atlas of the immune tumor microenvironment in this disease. This study revealed potential biomarkers and targets for immunotherapy development and validated tools that can be used for immune profiling of other tumor types. © 2016, Spandidos Publications. All rights reserved. Approved by the Food and Drug Administration in 2011, the anti-cytotoxic T-lymphocyte-associated protein 4 checkpoint inhibitor ipilimumab has delivered a survival benefit of =3 years in a subset of metastatic melanoma patients. After participating in the registration trial, patients were treated with this agent in routine practice. Toxicity and efficacy of agents in ¿real world¿ settings may differ from trials. The present study aimed to evaluate, with respect to toxicity and outcome, all patients treated with ipilimumab to date at the Princess Margaret Hospital (Toronto, Canada). Patients treated with ipilimumab between 2008 and 2013 were identified, and patient characteristics (age, gender, tumour burden, oncogenic mutation status, number of treatments received and toxicities from treatment) were collected. Progression-free survival (PFS) and overall survival (OS) were calculated from the commencement of ipilimumab treatment. Associations between clinical characteristics and outcome or toxicity were assessed. Between 2008 and 2013, 129 patients with metastatic cutaneous melanoma were treated. Since, during this period, ipilimumab was approved in the second line setting, ipilimumab was delivered in the second or subsequent line in all patients, and 70% did not receive any further anticancer therapy. Immune-related toxicities were observed, the onset of which varied from 1 to 162 days. The majority resolved within 6 weeks of the final treatment, with the exception of endocrinopathies and bowel related toxicity. The median PFS and OS were 2.83 and 8.44 months, respectively. No pre-treatment factor independently predicted toxicity. The number of infusions (4 vs. =3) and presence of toxicity were significantly associated with superior survival. The onset of toxicity secondary to ipilimumab could occur later than previously reported. Toxicities were manageable, but required long-term vigilance. Rare cancer stem cells (CSC) are proposed to be responsible for tumour propagation and re-initiation and are functionally defined by identifying tumour-initiating cells (TICs) using the xenotransplantation limiting dilution assay (LDA). While TICs in clear cell renal cell carcinoma (ccRCC) appeared rare in NOD/SCID/IL2R¿ 3 -/- (NSG) mice, xenografts formed more efficiently from small tumour fragments, indicating the LDA underestimated ccRCC TIC frequency. Mechanistic interrogation of the LDA identified multiple steps that influence ccRCC TIC quantitation. For example, tissue disaggregation destroys most ccRCC cells, common assays significantly overestimate tumour cell viability, and microenvironmental supplementation with human extracellular factors or pharmacological inhibition of anoikis increase clonogenicity and tumourigenicity of ccRCC cell lines and primary tumour cells. Identification of these previously uncharacterized concerns that cumulatively lead to substantial underestimation of TICs in ccRCC provides a framework for development of more accurate TIC assays in the future, both for this disease and for other cancers. © 2015, Springer Science+Business Media New York. Cancer cell lines can be useful to model cancer stem cells. Infection with Mycoplasma species is an insidious problem in mammalian cell culture. While investigating stem-like properties in early passage melanoma cell lines, we noted poorly reproducible results from an aliquot of a cell line that was later found to be infected with Mycoplasma hyorhinis. Deliberate infection of other early passage melanoma cell lines aliquots induced variable and unpredictable effects on expression of putative cancer stem cell markers, clonogenicity, proliferation and global gene expression. Cell lines established in stem cell media (SCM) were equally susceptible. Mycoplasma status is rarely reported in publications using cultured cells to study the cancer stem cell hypothesis. Our work highlights the importance of surveillance for Mycoplasma infection while using any cultured cells to interrogate tumor heterogeneity. © 2016 Cancer Research UK. Background:Radiological assessment of response to checkpoint inhibitors remains imperfect. We evaluated individual lesion and inter-patient response by response evaluation (RECIST) 1.1, immune-related response criteria (irRC), CHOI and modified CHOI (mCHOI) and correlated response with overall survival (OS).Methods:Thirty-seven patients with 567 measurable lesions treated with pembrolizumab in the Keynote 001 trial were studied. Association of response with OS was determined.Results:Response varied according to site; lung lesions had the highest rate of complete response (69 out of 163 (42%) vs other sites 71 out of 404 (18%), P<0.0001). Delayed response post first scan was seen in 2 out of 37 (5%) deemed progressive (PD) by RECIST and 2 out of 14 (14%) deemed PD by irRC. Modified CHOI criteria showed response of 38% (14 out of 37). Change in tumour size and density on first follow-up assessment was associated with OS with each 1000 mm 2 increase in tumour size from baseline increasing the hazard of dying by 25.9% (HR=1.259, (95% CI=1.116-1.420), P=0.0002). Similarly, each 20HU increase in density increased the HR by 15% (HR=1.15, (95% CI 1.045-1.260), P=0.004). Response defined by any criteria had superior OS (CHOI P=0.0084; mCHOI P=0.0183; irRC P<0.0001 and RECIST P=0.0003).Conclusions:Response by any criterion was prognostic. Novel patterns of response and changes on treatment in tumour density suggest complex anti-tumour responses to immunotherapy. Malignant melanoma is the most aggressive of all cutaneous tumours, with over 76, 000 new cases and 9700 deaths estimated for 2014 in the United States.1 In Canada, both the incidence and mortality of melanoma are increasing, with a risk of developing melanoma being 1 in 59 for men and 1 in 73 for women.2 The incidence of melanoma is higher in Australia, with a risk of 1 in 14 for males and 1 in 23 for females to age 85 reported for 2009.3 Although early melanoma can be managed surgically, until recently there have been few advances in the treatment of advanced melanoma. However, with the introduction of molecular targeted therapies, the landscape of melanoma treatment has changed dramatically in the past five years, resulting in improved survival rates for patients with metastatic disease. In this review, we will discuss the molecular basis and implementation for some of these novel treatments with particular emphasis on BRAF and BRAF inhibitors. PROM1 is the gene encoding prominin-1 or CD133, an important cell surface marker for the isolation of both normal and cancer stem cells. PROM1 transcripts initiate at a range of transcription start sites (TSS) associated with distinct tissue and cancer expression profiles. Using high resolution Cap Analysis of Gene Expression (CAGE) sequencing we characterize TSS utilization across a broad range of normal and developmental tissues. We identify a novel proximal promoter (P6) within CD133+ melanoma cell lines and stem cells. Additional exon array sampling finds P6 to be active in populations enriched for mesenchyme, neural stem cells and within CD133+ enriched Ewing sarcomas. The P6 promoter is enriched with respect to previously characterized PROM1 promoters for a HMGI/Y (HMGA1) family transcription factor binding site motif and exhibits different epigenetic modifications relative to the canonical promoter region of PROM1.© 2013 Sompallae, Hofmann, Maher, Gedye, Behren, Vitezic, Daub, Devalle, Caballero, Carninci, Hayashizaki, Lawlor, Cebon and Hide. The cancer stem cell hypothesis is an appealing concept to account for intratumoral heterogeneity and the observation that systemic metastasis and treatment failure are often associated with the survival of a small number of cancer cells. Whilst in vivo evidence forms the foundation of this concept, in vitro methods and reagents are attractive as they offer opportunities to perform experiments that are not possible in an animal model. While there is abundant evidence that existing cancer cell lines are not reliable models of tumor heterogeneity, recent advances based on well validated novel cancer cell lines established de novo in defined serum-free media are encouraging, particularly in the study of glioblastoma multiforme. In this chapter we wish to broadly outline the process of establishing, characterizing, and managing novel cancer cell lines in defined serum-free media, and discuss the limitations and potential opportunities that may arise from these model systems. © 2013 Springer Science+Business Media, LLC. "Cancer stem cells" that resist conventional treatments may be a cause of therapeutic failure in melanoma. We report a subpopulation of clonogenic melanoma cells that are characterized by high prominin-1/CD133 expression in melanoma and melanoma cell lines. These cells have enhanced clonogenicity and self-renewal in vitro, and serve as a limited in vitro model for melanoma stem cells. In some cases clonogenic CD133 + melanoma cells show increased expression of some cancer/testis (CT) antigens. The expression of NY-ESO-1 in an HLA-A2 expressing cell line allowed CD133 + clonogenic melanoma cells to be targeted for killing in vitro by NY-ESO-1-specific CD8 + T-lymphocytes. Our in vitro findings raise the hypothesis that if melanoma stem cells express CT antigens in vivo that immune targeting of these antigens may be a viable clinical strategy for the adjuvant treatment of melanoma. © Springer-Verlag 2009. Melanoma is often evaluated for the development of anticancer immunotherapeutics. Fascinating immune and clinical responses in small numbers of patients have prompted various approaches, ranging from nonspecific immune stimulation to therapies that target specific antigens Unfortunately, these immune therapies have often shown limited success and objective responses have been seen in only a modest subset of patients. The challenge has been to identify factors that can lead to more consistent clinical benefit and to develop strategies to overcome the obstacles to successful antitumor immunity. Over the last 15 years many immune targets have been identified in cancers and the mechanisms underpinning clinical responses have become better understood. Furthermore, new ways to manipulate anticancer immunity are making it possible to overcome cancer immune evasion and subversion. New therapeutic: strategies are resulting from these emerging insights into the relationship between melanoma and the host immune response. We present two cases of encephalopathy occurring after chemotherapy containing cyclophosphamide. Patient 1 was receiving vincristine, cisplatin and cyclophosphamide for recurrent medulloblastoma, whilst patient 2 received cyclophosphamide-containing chemotherapy as adjuvant treatment for early breast cancer. After cumulative doses of 2.8 and 6g/ m2 of cyclophosphamide both patients developed a gradual onset of fluctuating attention, slowed mentation and decreased consciousness. Extensive investigations excluded other causes of this altered conscious state. Given the similarity of presentation to ifosfamide encephalopathy, methylene blue (50mg i.v.) was administered. Patient 1 experienced an immediate improvement that was not sustained, with a subsequent deterioration over several weeks and became unresponsive before death. Patient 2 experienced a dramatic improvement within 3h and received a second dose of methylene blue with further improvement. To our knowledge, cyclophosphamide has not previously been implicated as a cause of encephalopathy. A review of the literature is presented. We hypothesize that cyclophosphamide may rarely cause encephalopathy and may also contribute to the cognitive dysfunction reported in association with chemotherapy for breast cancer and non-Hodgkin&apos;s lymphoma. © 2006 Blackwell Publishing Asia Pty Ltd. The Escherichia coli signal transduction protein PII, product of the glnB gene, was overproduced and purified. The predicted molecular weight of the protein based on the correct nucleotide sequence is 12,427 and is very close to the value 12,435 obtained by matrix-assisted laser desorption mass spectrometry. Hexagonal crystals of the unuridylylated form of PII with dimensions 0.2 × 0.2 × 0.3 mm were grown and analysed by X-ray diffraction. The crystals belong to space group P63 with a=b=61.6Å,c= 56.3 Å and Vm of 2.5 for one subunit in the asymmetric unit. A low-resolution electron density map showed electron density concentrated around a three-fold axis, suggesting the molecule to be a trimer. A sedimentation equilibrium experiment of the meniscus depletion type was used to estimate a molecular weight of 35,000 ± 1,000 for PII in solution. This result is consistent with the native protein being a homotrimer. © 1994. Siva S, Kron T, Martin J, Christie D, Lawrentschuk N, De Abreu Lourenco R, Carmichael A, Vanneste B, Gedye C, Mathias B, Hofman M, Brook N, Lo S.
When prostate cancer spreads, injections that suppress the male hormone testosterone can control the cancer for some time, but it almost always starts to grow again later. Hormone tablets to block testosterone on top of the injections can regain control of the cancer, but again, only for a limited time of about one year. Cancers grow like weeds; some of the cancer cells can be controlled by weedspray but other parts of the cancer aren’t affected and can flourish. These vulnerable and resistant cells of the cancer are often holding each other in balance; and when a treatment is used it can favour one group of cancer cells over another. This trial is designed to test the idea of taking breaks off taking hormone tablets, using them for long enough to control the cancer, but then stopping and saving them up until later to treat the cancer again (and again… and hopefully again and again). While every man’s cancer is predicted to eventually become resistant to hormone treatments, using hormone tablets in a sparing and cunning way is hoped to spread the benefit over a longer period of time, without more side-effects. Very early reports with other drugs support this idea; this will be the first trial testing this idea with enzalutamide (Xtandi). If this idea proves to be sound, it may improve the lives and survival of men with prostate cancer. The commonest kind of advanced kidney cancer is called clear cell kidney cancer. Immune therapies have been shown to be effective in about a quarter of patients with advanced clear cell kidney cancer after the standard tablet treatment has failed. This study will test if a drug (denosumab) usually used to treat osteoporosis (thinning of the bones) or cancer that has spread to the bones, can be added to the immune therapy to increase the ability of the body’s immune system to attack kidney cancer cells. This study is designed to assess the effects and safety of the combination of two drugs; pembrolizumab and denosumab. All participants on the trial will receive both treatments. Blood and cancer samples will be collected from each patient to better understand who has benefited and who has been failed by the treatment combination. In this clinical trial ANZUP will test whether new immune treatments can help people with rare kidney cancer (‘non-clear cell’ cancer). Non-clear cell represents approximately 25% of people with kidney cancer; and because it is rare there are no treatments currently reimbursed in Australia. The UNISoN trial will test immune treatments in two different ways; firstly we will find out how well one immune treatment (nivolumab) works alone. If this is unhelpful by itself, then people can continue taking nivolumab but also add in a 2nd immune treatment (ipilimumab). We will discover how many people will benefit from one drug alone, and by doing detailed laboratory testing of people’s cancer samples, hope to also learn who will only benefit from taking both treatments together. Nivolumab and ipilimumab have been used alone or together in many cancers, so the side-effects are well known and should be manageable. Immune treatments help some people with cancer, especially those with melanoma, common (clear cell) kidney cancer, lung and bladder cancer. Unfortunately they are much less effective in other cancers (like pancreas, prostate and brain cancers). Nivolumab and ipilimumab have not been tested in people with non-clear cell kidney cancers, so ANZUP is delighted to ask this question, and hope to help people with this rare disease. Khasraw M, Rosenthal M, McDonald K, Ashley D.
Does cannabis help people taking chemotherapy? There is anecdotal evidence but this clinical trial will provide a definitive answer. 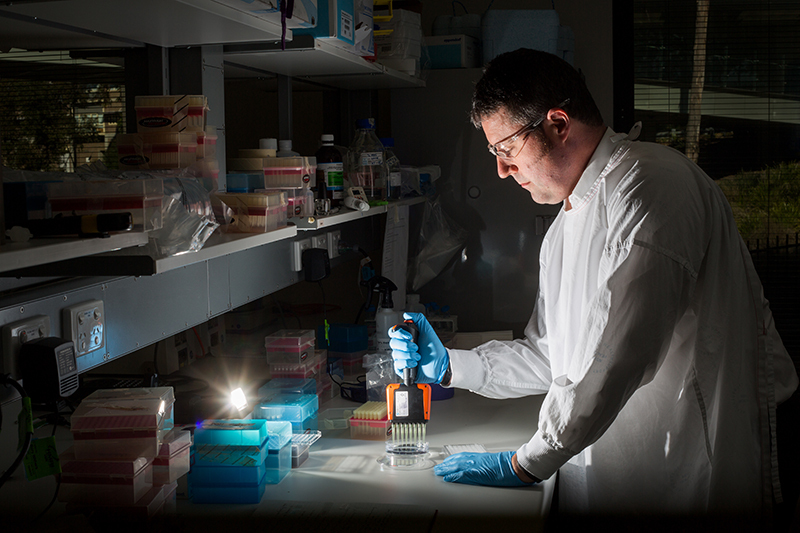 Mark Hughes Foundation travel grants give Hunter researchers the chance to build clinical trial collaborations.